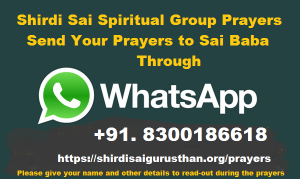 Your prayers to SHIRDI SAI BABA : Weekly Consolidated List for Considering Shirdi Sai Spiritual Group Prayers on GURUVAAR – 06th September 2016, 09:00 hrs. 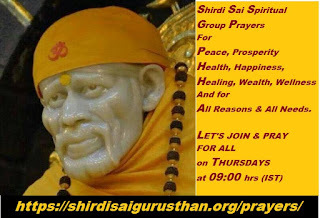 Weekly Consolidated List for Considering Shirdi Sai Spiritual Group Prayers on GURUVAAR – 06th September 2016, 09:00 hrs. When our prayers from all parts of the world focusing on a specific day & specific time (ALL THURSDAYS at 09:00 hrs IST) with a single object and total concentration on praying for others, with our noble intention of getting help from Shri Sai Baba for those known and unknown to us, praying selflessly for the benefit of all global Sai families, certainly this divine vibrations from all participating devotees all over the world energize and elevate our subconscious mind with powerful spiritual vibrations, that our group prayers shall have the capability to release divine guidance, divine protection, averts disaster, very powerful divine impact and more importantly all participants witness powerful answers to our prayers. BABA DO SOMETHING TAHAT OUR BANK GET FINANCIAL ASSISTANCE FROM GOVT OF WEST BENGAL. Sairam, I lost my job, my final hope is Sai. Sai to get me job. Whenever I am in worst condition Sai helped me. I know Sai will give me a new job. Please pray for me. Sai g please help me . 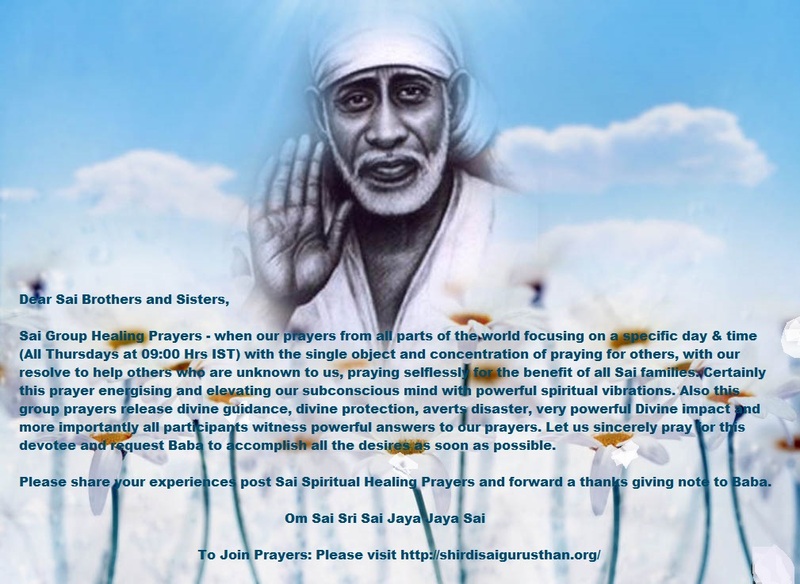 Sai g please give me confidence Sai g please fill my mind with positive thoughts. Sai g please please help me and make me a normal girl. Sir give me peace of mind. Everyday is a challenge for me. Pray for me to come out of it. I am very much desperate and shedding tears all the time. Please pray for me. Sairam, Please pray for my job to get selected in val genesis private ltd.
Good morning. Please pray for me to get the amount I expected today. I am struggling with financial problems. I too hope I would get it definitely. I have to pay for my jewels which are to be auctioned. Please pray for my dad to be recovered from a injury. 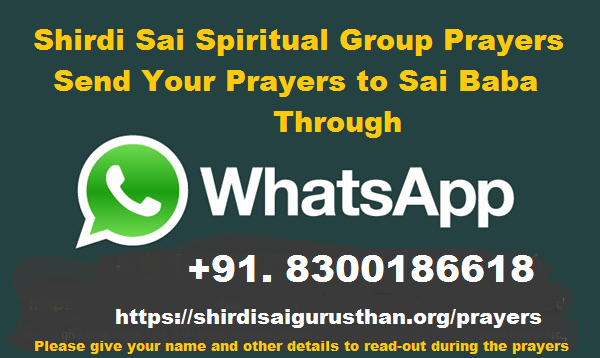 Sai group members, it is my small request to all.
" Om Sai Ram Jai Sai Ram " O Sainatha please shed your ultimate grace upon me and my family members. Please bless me with a job for survival.